A retro knit tee inspired by '90s soccer jerseys. Ignited by the flame of soccer. 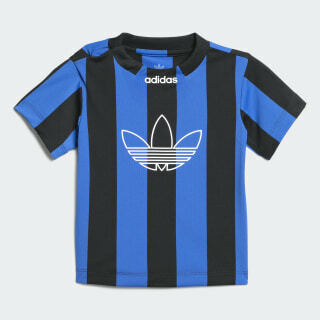 Retro '90s soccer jersey style inspires this toddlers' t-shirt. A faux fold-down collar and two-color knit stripes add an authentic vibe. An oversize Trefoil outline completes this sporty tee.